Port Louis (French: Port-Louis, Mauritian Creole: Porlwi, [poːlwi]) is the capital city of Mauritius. It is mainly located in the Port Louis District, with a small western part in the Black River District. Port Louis is the country's economic, cultural and political centre, and most populous city. It is administered by the Municipal City Council of Port Louis. According to the 2012 census conducted by Statistics Mauritius, the population was 149,194. Port Louis was already in use as a harbor in 1638. 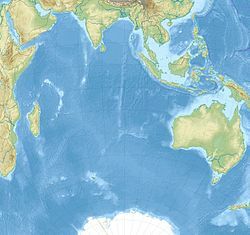 In 1735, under French government, it became the administrative center of Mauritius and a major reprovisioning halt for French ships during their passage between Asia and Europe, around the Cape of Good Hope. The Port is named in honor of King Louis XV. During this period of French colonization, Mauritius was known as Ile de France. The French governor at that time, Bertrand-François Mahé de La Bourdonnais, contributed to the development of the city. Since Port Louis was relatively well-protected from strong winds during cyclones by the Moka Mountain Range, Port Louis was selected to house both the main harbor and fort for the island. Value of the port continued during the British occupation of the island during the Napoleonic Wars (1800–15), and helped Britain control the Indian Ocean. However, port calls of ships fell drastically following the opening of the Suez Canal in 1869. Activity in the port increased during the seven-year closure of the Suez Canal (starting in 1967). Modernization of the port in the late 1970s has helped it maintain its role as the central point for all imports and exports from Mauritius. While Port Louis continues to be the business and administrative capital of Mauritius, expansion of the tourism industry in the late 1990s led to considerable development in Port Louis, with many shops, hotels, and restaurants being built in the Caudan Waterfront area. Source #1: World Meteorological Organization. Port Louis is home to the nation's main harbor, which is the only official port of entry and exit for sea vessels in Mauritius. Ships must be cleared in the port before visiting any other anchorage in the island nation. The Mauritius Ports Authority (MPA), established by law in 1998, is the port authority responsible for Port Louis. The MPA provides port infrastructure, enters into contracts with private providers for port and cargo-handling services, promotes the use and development of the ports, and licenses and regulates port and marine services. The harbor adjoins the main city, with the port currently comprising three terminals. Terminal I contains a total of 1180 meters of quay, with six berthing positions for cargo, passengers, and fishing boats. Terminal II contains 986 meters of quays with six berthing positions, and includes specialized facilities for handling and storing sugar, fish, tallow, and caustic soda. In particular, the Bulk Sugar Terminal (operated by the Mauritius Sugar Terminal Corporation) can handle vessels with up to 11 meters of draft, can load sugar at a rate of 1450 tons per hour, and can store 175,000 tons of cargo. Also present in Terminal II is a dedicated 124-meter cruise ship jetty, with a dredged depth of 10.8 metres. Terminal III has two 280-meter quays with a depth of 14 meters, and is specialized for handling container ships, having five post-Panamax gantry cranes. Also present are storage facilities for bulk ethanol and tie-in points for reefer containers. Vessels too large to dock at the quays can anchor at the Outer Anchorage, which is still within the official boundaries of the port. In 2012, the government decided to construct an approximately 25-km rail system between Curepipe and Port Louis, which had been under consideration for nearly three decades. The project was initiated by a government-to-government agreement with the Singapore Cooperation Enterprise (SCE), along with private partners Singapore Mass Rapid Transit (SMRT) Corporation and the South African/Australian engineering firm Aurecon Ltd. The goal was to develop a preliminary plan of the system, and then solicit expressions of interest for a design-build-operate-finance scheme, with a concession period of 33 years. As of May 2014 a concession has not yet been awarded. The current plan includes a northern terminus at Port Louis' Victoria Station. This would restore passenger rail service to Port Louis for the first time since March 1956. Construction for the light rail transit transport system began in the Fall of 2017, with the government of Mauritius awarding the contract to Mumbai-based design and construction firm of Larsen & Toubro. The Mauritius Metro Express is expected to link Port Louis to Rose Hill by September 2019 and the line will be extended until Curepipe by September 2021. Port-Louis houses several secondary schools which includes Alpha College, Bhujoharry College, Labourdonnais College, and Port Louis Academy, Loreto College, Madad Ul Islam Girls College, Muslim Girls College, City College, Full Day School, Institute of Islamic and Secular Studies, London College, Ocep The Open College, and Port Louis High School, MEDCO Trinity Secondary School, MEDCO Trinity Secondary School, Port Louis North SSS, and Sir Abdool Razack Mohammed SSS, Goolam Mohammed Dawjee Atchia State College, MEDCO Cassis Secondary School, Renganaden Seeneevassen SSS, Port Louis SSS and Royal College Port Louis. The state also operates a vocational school for boys, Immaculee Conception SSV. I think Port Louis is — pound-for-pound — one of the greatest little cities in the world. Port Louis simply seems to have everything and the human productivity and hustle to drive it all. While some offices are slightly dusty, or perhaps a bit small by modern standards, you can get trousers shortened or eat dumplings between meetings. You can go to a museum, buy cheap sunglasses and walk along the Caudan without having to extend your lunch break. The Blue Penny Museum is located at the Caudan Waterfront, and is dedicated to the history and art of the island. Its collection includes antique marine maps, paintings, sculptures, engravings, and stamps, including examples of the famous orange-red one penny and deep blue two pence stamps. The Natural History Museum of Port Louis houses exhibits of the impressive fauna of Mauritius, with a gallery devoted to birds and terrestrial animals, a second focusing on marine species, and a third focused on the dodo, the famous Mauritian bird which became extinct during the Dutch occupation. The Mauritius Postal Museum is housed in an old stone building that dates to the 18th century, and houses displays of stamps and postal paraphernalia from Mauritius and around the world. The Mauritius Photography Museum, located in a small 18th-century white-washed French colonial building, is a private museum that displays artifacts and documents about Mauritian photography and the early days of cinematography. The China Heritage Museum, located in Chinatown, displays historical items representing the daily life of the Chinese community. Currently closed for renovation (2014) is Aapravasi Ghat, which is the remains of the immigration depot that was built by the British Government to import laborers from India, Eastern Africa, Madagascar, China and Southeast Asia to work on the island’s sugar estates. Although not a museum in a traditional sense, the National Library of Mauritius houses a rich and comprehensive collection of material related to Mauritius history, including manuscripts, books, newspapers, periodicals, music scores, photographs, maps, drawings and other graphic art forms and audiovisual materials, in addition to providing the traditional services of a library to residents of the city and nation. ^ a b Ministry of Finance & Economic Development (2016). "Annual Digest of Statistics 2015" (PDF). August. Government of Mauritius: 22. Retrieved 23 December 2016. ^ World Weather Information Service-Port Louis, World Meteorological Organization. Retrieved 29 September 2012. ^ "Average Conditions Port Louis, Mauritius". BBC Weather. Retrieved 29 September 2012. ^ "Port of Port Louis". World Port Source. Retrieved 24 July 2012. ^ "Mauritius Ports Authority - Harvesting Resources under the Blue Economy". Mauport.com. Retrieved 26 August 2017. ^ "An ocean of economic opportunity". The Business Report. Retrieved 24 January 2019. ^ A. B. Ramsaha. 2011. Port Louis Harbor. Presentation at African Ports and Maritime Conference, Namibia. ^ "Republic of Mauritius –Prime Minister Inaugurates Port Louis Ring Road (Phase 1)". Govmu.org. Retrieved 26 August 2017. ^ "Dream bridge to ease access to harbour". Lexpress.mu. 3 September 2007. Retrieved 26 August 2017. ^ "Light Rail Transit back on track". Le Defimedia. Archived from the original on 29 March 2014. Retrieved 30 October 2012. ^ "Republic of Mauritius-Metro Express project to the tune of Rs 18.8 billion to kick-start in September 2017". www.govmu.org. Retrieved 26 August 2018. ^ "Porlwi by light". —. Archived from the original on 13 January 2016. Retrieved 2 January 2016. ^ Schuetze, Christopher F. (26 May – 1 June 2016). "CYBERCITY; What it tells us about smart cities". Weekly. La Sentinelle. ^ "Municipales et villageoises : les 6 principaux changements" (in French). Le Defimedia. Archived from the original on 23 November 2012. Retrieved 15 December 2012. ^ "Electoral Commissioner's Office - Port Louis". Electoral.govmu.org. Retrieved 26 August 2017. ^ "Mauritius Sports Council : Home". Mauritiussportscouncil.com. Retrieved 26 August 2017.